Is this some sort of strange version of musical chairs, where everyone runs around in a circle and when the music stops you must eat a brownie or else you’re out – except there are fewer brownies than people, and each time new brownies are added in smaller and smaller numbers, so the goal is to stay in the longest and therefore get to eat the most brownies? No, it’s not. I’m really sorry. But if that is ever made into a game, I promise you: I will win. 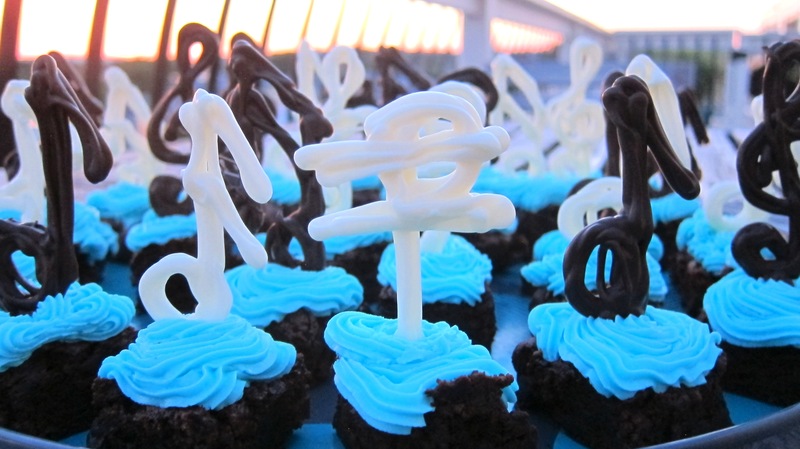 Particularly if they are these brownies. Remember the “omg drool just-like-box-mix” cocoa brownies I told you about earlier? Well, this time they’re getting an upgrade. 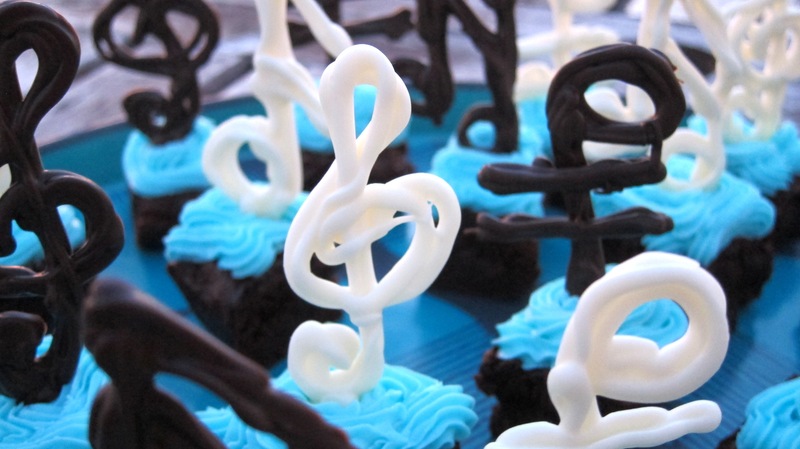 Same amazing brownies, but topped with buttercream frosting and chocolate musical note garnishes. Although you really should be thinking “Brilliant!! 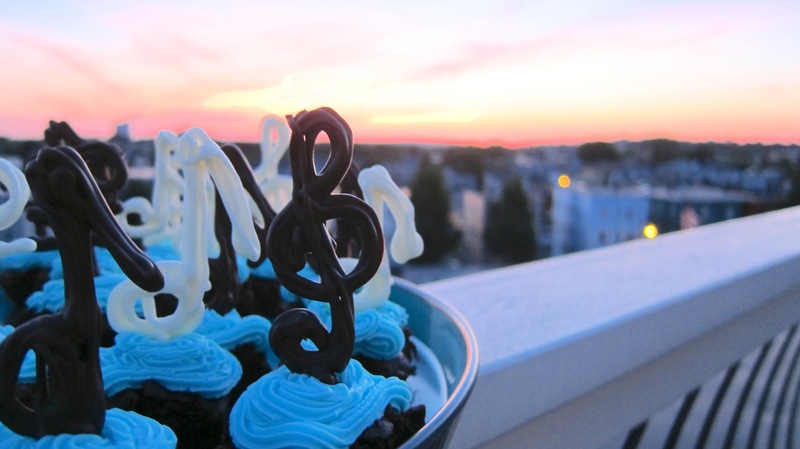 I must make these immediately!”, if you are instead wondering why I would ever do this, then 1) stop questioning my genius ideas, and 2) my reason is that I needed to bake something for a blues dance. 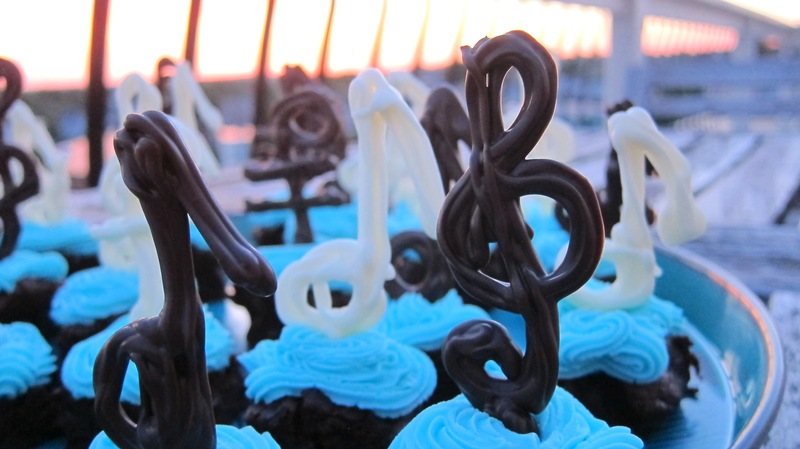 Blues → blue frosting, dance → music → music note garnishes. Compris? 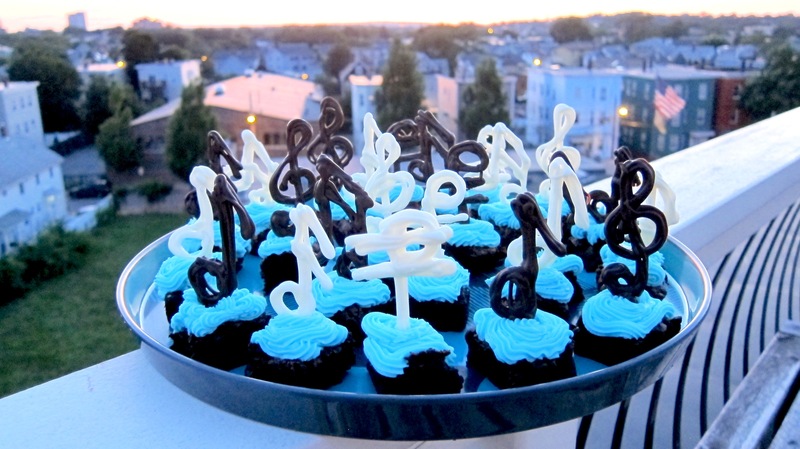 I might just encourage (*ahem* force…) my future children to join band PURELY so I can sell these at band bake-sale fundraisers. 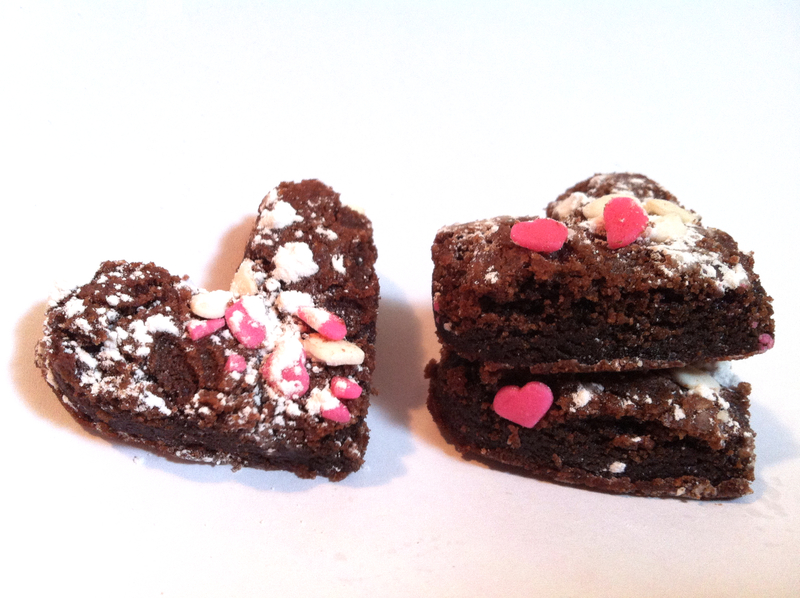 Because, let’s be honest with ourselves here: who could avoid these temptress brownies?! That’s right. No one. You’re welcome, future child’s band, for all the money I will raise for you. You’re welcome. 5. While the brownies are cooking, make the chocolate garnishes. Lay wax paper down on a moveable flat surface (cookie sheets, cutting boards, etc.). Place chocolate in a microwave-safe plastic bowl (not glass). Microwave in 10-second bursts, stirring after every burst. Between 3-5 rounds, you should be able to stir until smooth; you can microwave for additional 5-second bursts once it’s smooth, but do not over-heat! You want the chocolate to stay “in temper” as much as possible. This video by How To Cook That provides a fantastic tutorial for this process (note that I used chocolate chips instead of chocolate shavings; it still worked). Put the chocolate in a plastic bag and snip off just the tip (don’t cut off too much). Pipe different music notes, treble clefs, etc. onto the wax paper, making sure to add a thick “stem” to the bottom (at least 2 cm) that will stick in the brownie and hold the design up. Put chocolate garnishes in the refrigerator to harden up. 6. When the brownies are done cooking, cool them completely (I put mine in the freezer for about 30 minutes) and then lift the paper + brownies out and set aside. 7. Once the brownies are completely cooled, make the frosting. Beat together half of the sugar and all of the butter. Start on low speed until well-blended and then gradually add in more sugar. Increase speed to medium and beat for another 3 minutes. Add vanilla and cream and continue to beat on medium speed for 1 minute more, adding more cream or powdered sugar as necessary to reach spreading consistency. Gel food coloring should be beat or stirred in as desired to reach the color you’re looking for. 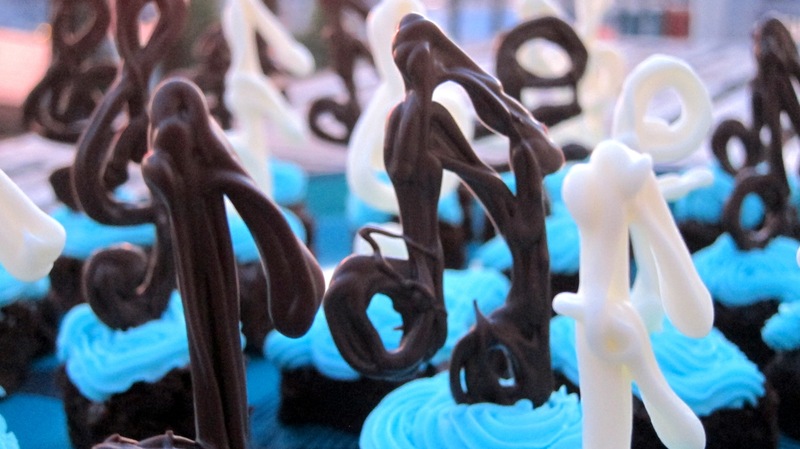 Put the frosting into a piping bag with any decorating tip you like. 8. 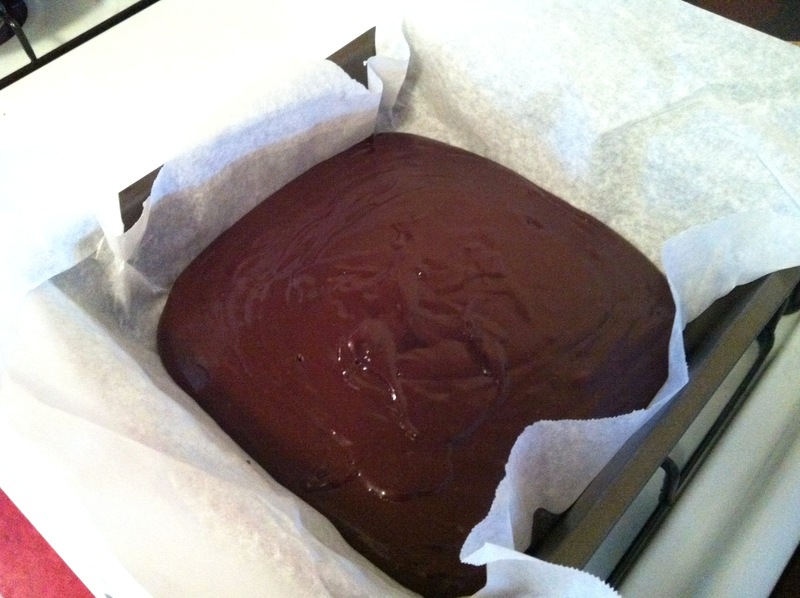 Cut the brownies into ~25 small squares and then pipe frosting onto each brownie. 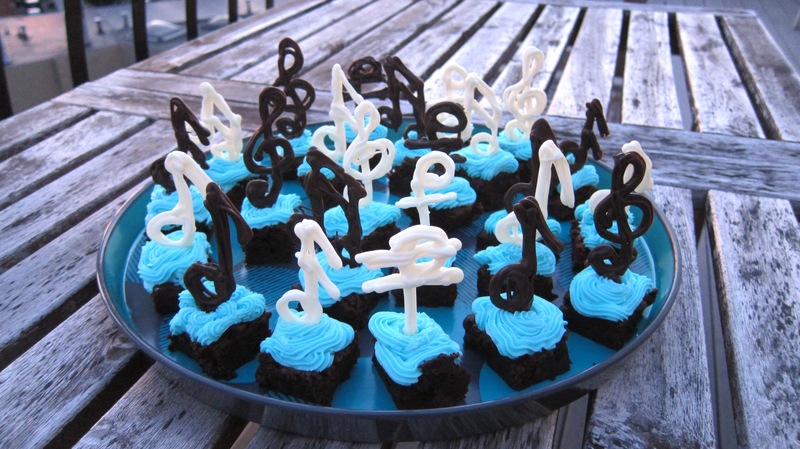 Gently inset a music note into every brownie, holding the garnish by its base so you don’t snap the top off while you’re pushing it down. In case you’re curious, these were a huge hit and did not last long before every last one was snatched up by a happy dancer. Not bad for something that’s super easy to make in under two hours! You could easily top them with any other garnish (stars, hearts, simple logos, etc.). Get creative! My friend, Matt, is visiting from Cornell this weekend. We celebrated St. Patrick’s Day by making this AMAZING Guinness Chocolate Cake with Baileys Irish Cream Cheese Frosting. Seriously, check it out because that cake is delicious! We had the brilliant last-minute (read: poorly thought out) idea to add chocolate ganache in between cake layers… which oozed out everywhere, got all mixed up in the frosting, made the top layer slide, and rendered our delicious cake TUTP (“too ugly to post”). I still think a chocolate layer would take this cake over-the-top, so if you make the recipe, I recommend looking around for a good, thick ganache filling recipe (maybe this one?). Let me know if you can get it to work, because I’d love to successfully make this cake with a chocolate layer someday! 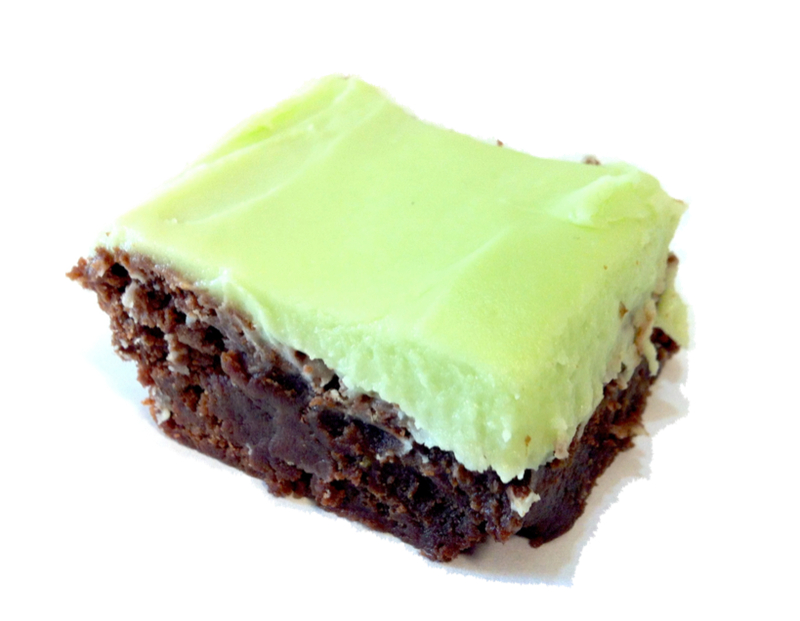 We were left with extra frosting from that adventure, so Matt whipped up this tasty, fudge-y brownie recipe from AllRecipes and we covered it with the leftover Baileys Irish Cream Cheese Frosting. This is quite a decadent pairing, and so perfect for St. Patrick’s Day. Cut small pieces because it’s insanely rich. If you’re just making the brownies and not the cake, only make a quarter of the frosting recipe. All recipes are provided at the links, so I won’t repeat them here. Enjoy!! Eleven students in my department recently took their qualifying exams (“quals”). Quals consist of five very open-ended, difficult questions written by five different professors. You have three days and three hours to complete the take-home exam, using any books, notes, the Internet, etc. that you want – you just can’t discuss the questions with anyone. Remember open-note exams in college? And how they were often more difficult than close-note exams? Well this is like that… but a million times harder. You have to pass quals to become an official PhD candidate, and you only get two chances. Yikes! I’ll be taking this monstrous exam in a year, but this time around, I got to be on the “good luck” committee! Which doesn’t exist. I invented it. But it ought to exist. 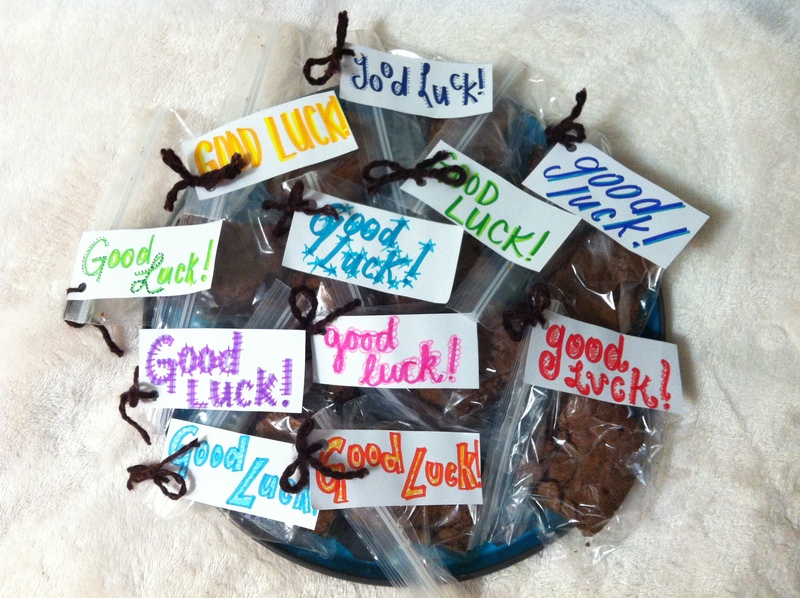 Because who doesn’t want a good luck brownie when they’re going into a three-day exam?! While all the quals kids suffered, you can 1) be thankful that you are not in their shoes, and 2) consider making this recipe of fudgy, sugary ridiculousness. These brownies were inspired by a recipe from the book “Bake it in a Cupcake” by Megan Seling, which my best friend gave me for my birthday. This cookbook contains a bunch of fantastic desserts baked into various flavored cupcakes for double the awesomeness. I adapted the Seven-Layer Bar Brownie Cupcakes and made a tray of brownies instead. I increased many of the ingredients, added toffee bits to the brownies, and went bonkers over the crazy increase in baking time. 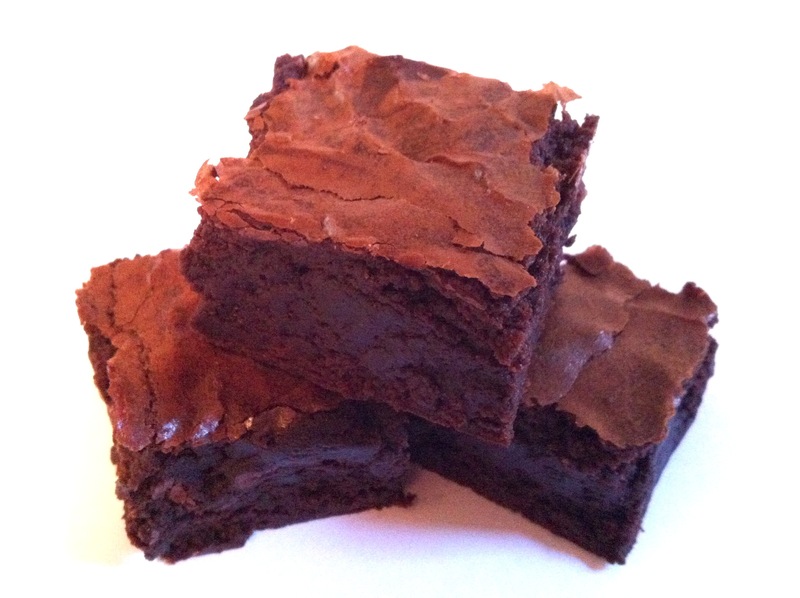 These brownies are almost like fudge on the inside, they’re so gooey and sugary. 1. Make the seven-layer bars first. Preheat oven to 350F, spray a 9”x13” baking dish with nonstick cooking spray. Stir the melted butter & graham cracker crumbs together until all crumbs are moist; press them into the bottom of the pan. Evenly layer the rest of the ingredients, in the order listed, over top of the crust. Pour the condensed milk over the top and bake for some crazy amount of time. The book says 25 minutes; mine took 35+. You want the edges to be bubbling and the coconut starting to turn golden brown, but the inside of my bars was still a bit gooey at this point so I ended up cooking an extra 10+ minutes. Cool completely before cutting (but be sure to sample the corner while it’s warm, accompanied by a glass of milk!). 2. Make the brownie batter once the seven-layer bars are cool. Place the chocolate and butter in a medium microwave-safe bowl and microwave on high for 90 seconds, stopping halfway through to stir the butter and chocolate together. Continue stirring until everything melted together – you can microwave a tiny bit more as necessary, but be really careful you don’t burn the chocolate. It’s much better to stir and wait for the chocolate to melt slowly. Using a wooden spoon, stir in the granulated sugar until it’s well-mixed. Stir in the eggs, one at a time until the mixture is smooth. Add the salt and vanilla and stir for 30 seconds, until they’re both well-mixed. Mix in the flour until just combined – don’t overstir! 3. Finally, assemble the brownies. Cut up the seven-layer bars into 1.5-2 inch squares (it doesn’t matter how neat these squares are) and move to a different plate/container. Wash the 9-inch by 13-inch pan, dry, and spray again with nonstick cooking spray. Pour about half the brownie batter into the tray, gently place squares of the seven-layer bars on top so they’re almost touching each other, and pour the rest of the brownie batter on top. Bake for goodness knows how long. I think I ended up baking for 50+ minutes. Keep testing the brownies with a toothpick. The edges and top will be very crusty, but the inside stays oh-so-gooey, so pull them out when there’s just a tiny bit of dough sticking to the toothpick. Allow them to cool before cutting (you can refrigerate them after 15 minutes if you want to speed this step up).